2,4-D and dicamba are common examples of a class of herbicides known as synthetic auxins. Auxins are naturally occurring plant hormones. Synthetic auxins can be used to kill weeds by inducing hormonal effects on sprayed plants. These effects are usually characterized by severe distortion of stems and leaves. Unintentional application of a synthetic auxin herbicide to a sensitive plant, either through direct application or spray drift, often causes severe injury, loss of yield, and even death of the non-target plants. Not all fruits, vegetables and landscape plants are highly sensitive to synthetic auxins, but most will react to exposure in characteristic ways (Figures 1–3). Why should you be concerned about synthetic auxin herbicides? Simply because 2,4-D and dicamba are likely to be used much more extensively and intensively throughout the Midwest, starting in the near future. A little history will help to put the elevated risk in perspective. 2,4-D is considered to be the first modern herbicide and has been in continuous use on farms, roadsides and lawns since the late 1940s. Dicamba was first released as a commercial product in the 1960s and continues to be used for weed control in corn, wheat, pastures and lawns. Unfortunately, some older 2,4-D and dicamba formulations were notoriously prone to spray drift and to post-application volatilization. This caused unintentional damage to, and even death of, sensitive crops and other plants present in nearby fields and homesteads. Over time, lawsuits and government regulations resulted in changes to the way these herbicides were used, and to physical/chemical characteristics of the formulations, to reduce the potential for off-site movement. Nevertheless, 2,4-D and dicamba have been among the most likely herbicides to be implicated in spray drift cases. For example, survey results of state pesticide control officials listed 2,4-D as the herbicide most often involved in pesticide drift incidents (crop damage) every year the survey has been taken (2005 AAPCO Pesticide Drift Enforcement Survey). The same survey lists dicamba as the 3rd most commonly involved in drift incidents for two years in a row. This level of drift occurrence far outpaces the relative use of these herbicides: 2,4-D is the 7th most commonly applied conventional pesticide active ingredient and dicamba is not even among the top 25. This is because these active ingredients are toxic to many broadleaf plants at ultra-low concentrations; hence, drift damage symptoms develop readily and are easy to see and identify. Figure 1. 2,4-D damage on grapes. Figure 2. 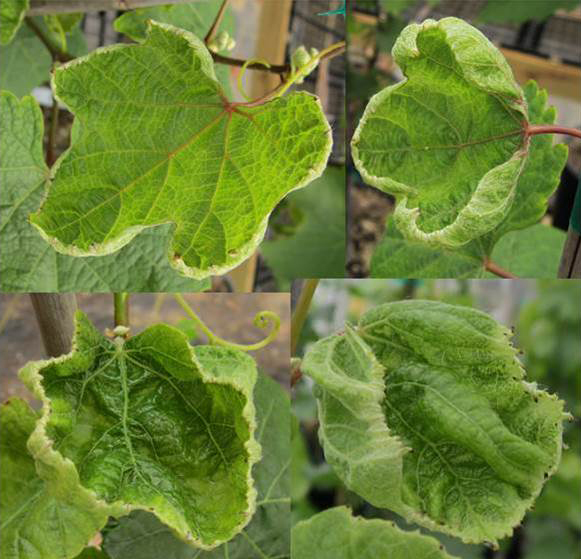 Grape response to simulated drift of dicamba. Figure 3. 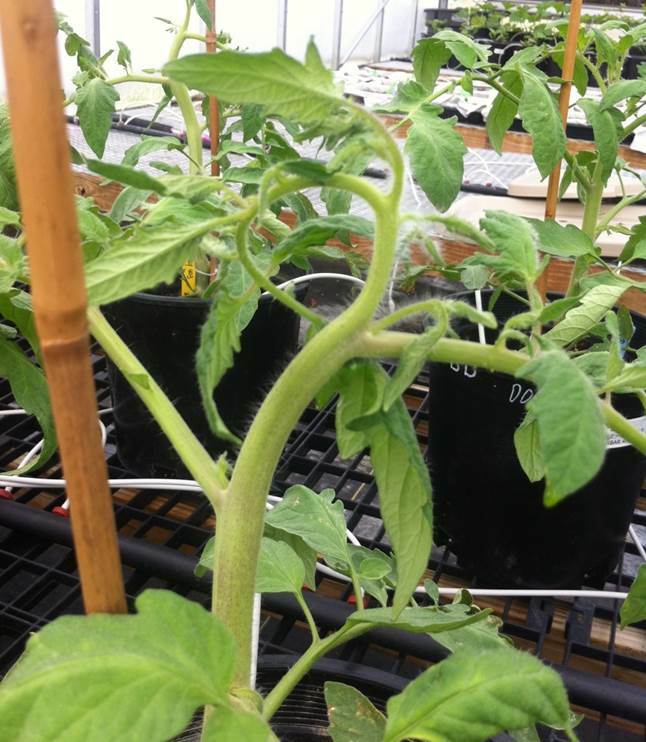 2,4-D damage on tomato. There are several reasons why these herbicides are being used more by grain farmers. The main reason is that proliferation of weed species with high levels of resistance to the most commonly used herbicide, glyphosate, is making weed control with current methods ineffective (Figure 4). In response, new approaches to managing resistant biotypes are being pursued. These new approaches currently center on the 2,4-D-based Dow AgroSciences’ EnlistTM Weed Control System and Monsanto’s dicamba-based Roundup Ready® Xtend Crop System. The EnlistTM system involves genetic modifications to corn and soybeans to produce tolerance to 2,4-D and glyphosate. The Xtend system will provide tolerance to dicamba and glyphosate in soybean. How quickly can you expect increased use of 2,4-D or dicamba in fields near you? It’s difficult to say with certainty but on September 17, 2014, the U.S. Department of Agriculture issued its decision deregulating Dow AgroSciences’ EnlistTM corn and soybean traits in the United States. Following this action Dow AgroSciences’ 2,4-D containing Enlist DuoTM herbicide, the companion herbicide to the EnlistTM traits, was approved by the U.S. Environmental Protection Agency (EPA) on October 15, 2014. The Xtend system is awaiting regulatory approval. So why should we be concerned? Ohio grain farmers grow more than 4 million acres of soybean and more than 3 million acres of corn, nearly all of which are sprayed with herbicides to control weeds. A consequence of the new genetically modified (GM) crops is that many, perhaps nearly all, of these acres will be sprayed with 2,4-D or dicamba in the future. Not only is use of these herbicides likely to increase, but patterns of use will change as well. A stated benefit of the EnlistTM and the XtendTM weed control systems is they give extended application flexibility before planting, at planting, and after planting. This intended change in the use pattern increases the likelihood that applications to corn and soybeans will coincide with the more susceptible growth stages of sensitive crops and plants such as fruits, vegetables and landscape plants. Changing weather patterns may further impact application timing resulting in applications coinciding with susceptible growth stages of sensitive plants. In 2013 an unprecedented number of drift damage incidents involving vineyards occurred in Ohio due in part to weather conditions that resulted in burndown herbicide applications coinciding with susceptible growth stages of grapes. Though vineyard acreage is small compared to row-crop acreage, the fact that vines are a perennial crop, and grape harvests and products have high value, means that a little damage can have large economic consequences. Figure 4. 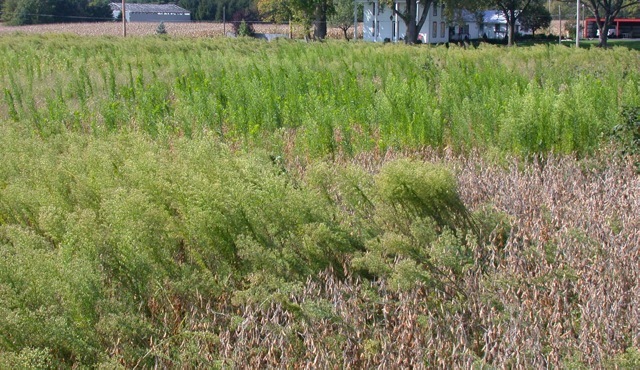 Glyphosate resistant horseweed in soybeans (photo courtesy of Mark Loux). How is the risk being reduced? Many specialty crop growers fear that these new GM crop technologies and their specialty crops cannot co-exist. However, the perceived risks may not be as high as many people fear. 2,4-D and dicamba have, after all, been used on millions of acres since the 1960s and while drift and volatility have been an issue (Figure 5), the approved use of these products has not resulted in widespread catastrophic damage. Dow AgroSciences, Monsanto and BASF have taken great care to minimize the known negative attributes of older 2,4-D and dicamba formulations. Dow AgroSciences has developed Enlist DuoTM that includes a new low-volatility formulation of 2,4-D with minimized drift potential, lower odor, and better handling characteristics than currently available 2,4-D amine or ester formulations. BASF plans to produce a “technologically advanced” dicamba formulation branded EngeniaTM for use on dicamba-tolerant crops, including soybeans and cotton, that has been formulated to provide increased weed control and reduced volatility. Educational and outreach programs to farmers, dealers and commercial applicators (EnlistTM Ahead) to promote and encourage good stewardship of the new system have also been initiated. Risks associated with dicamba will also be reduced through product formulation and stewardship programs. A premix of dicamba and glyphosate herbicide branded as Roundup XtendTM with VaporGripTM technology will be introduced upon regulatory approval of the Roundup Ready® Xtend Crop System. This low-volatility formulation will be labeled for use before, at and after planting. Figure 5. 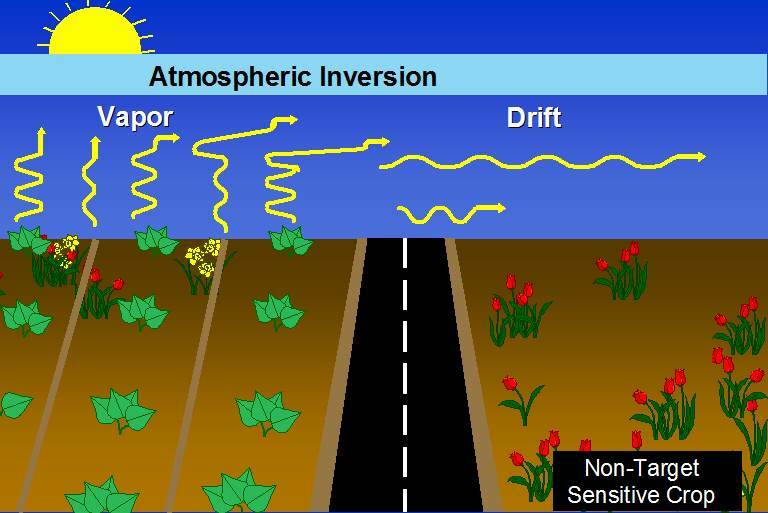 Schematic showing herbicide vapor drifting into sensitive non-target crop. The Environmental Protection Agency (EPA) defines spray drift as the movement of pesticide dust or droplets through the air at the time of application or soon thereafter, to any site other than the area intended. As a result of extensive research, the causes and fixes of spray drift are well known and documented. For example, using nozzles and pressures that result in the creation of fine spray droplets, and/or spraying during windy conditions greatly increase the risk of drift. Pesticide labels routinely contain much information on steps that applicators should take to reduce the risk of drift occurring. The instructions on the pesticide label are given to ensure the safe and effective use of pesticides with minimal risk to the environment. Many drift complaints result from application procedures that violate the label instructions. Volatilization occurs when pesticide surface residues change from a solid or liquid to a gas or vapor after an application of a pesticide has occurred. Once airborne, volatile pesticides can move long distances off site. The potential for a pesticide to volatilize is related to the vapor pressure of the chemicals involved. Pesticides with high vapor pressure are likely to be more volatile than those with low vapor pressure. Pesticides known to have the potential to vaporize carry label statements that warn users of this fact. While there are things that the applicator can control (e.g., nozzle tip, pressure, boom height) to reduce spray droplet or dust drift, vapor drift is dependent upon the weather conditions at the time of application since the likelihood of pesticide volatilization increases as temperature and wind speed increases and if relative humidity is low. Despite an applicator’s best intentions, the risk of spray drift occurring is always present, most often as the result of the factors involved that are not under the applicator’s control, e.g., changing weather conditions. To reduce misunderstanding, we suggest an ongoing dialogue between specialty crop growers and their neighbors who grow corn and soybean and with commercial spray applicators who are likely to use 2,4-D and dicamba. Help these individuals better understand specialty (fruit, vegetable and nursery crops) production and the impact of it on the state’s economy. Promote awareness among agronomic crop producers that vineyards, extensive landscape plantings, or other susceptible crops are located in their neighborhood. Given the recent rapid growth in the number of vineyards, it is likely that some neighboring farms don’t even know grape growers exist in their vicinity, let alone the cost involved in establishing just one acre of wine grapes or the potential value of the crop. Creating and maintaining a heightened awareness of the industry is probably the most important way to reduce risk of future herbicide damage and the lawsuits that will inevitably follow. The following steps may be useful to help the specialty crop industry develop a process for creating and maintaining awareness and reducing the risk of drift damage. Step 1. Inform your nei​ghbors. Develop and maintain a good relationship with your neighbors. A good relationship starts with open communication. Offer a tour of your operation, explain how damaging drift of glyphosate, 2,4-D and dicamba can be to your crops. In the case of vineyards, make sure to point out the potential for herbicide drift to cause yield loss, poor grape quality, increased susceptibility to cold injury, and reduction in long-term profitability. Discuss the possibility of planting buffer vegetation between your crops and your neighbors’ crop(s) to reduce risk. Step 2. Mark your farm or vineyard on an online database. Neighboring farmers and commercial spray applicators will need accurate information on where specialty crops are being grown. The Ohio Department of Agriculture has launched a website designed to incorporate coordinates for fields planted to sensitive crops into Google Maps. This site is known as the Ohio Sensitive Crop Registry (Figure 6) (agri.ohio.gov/scr). Applicators can check this website for proximity of sensitive crops to fields they are planning to spray. If you farm near roadways or other rights-of-way contact your county or state highway department, power company, etc., since hormone-type herbicides are likely used for weed control in those situations already. Figure 6. 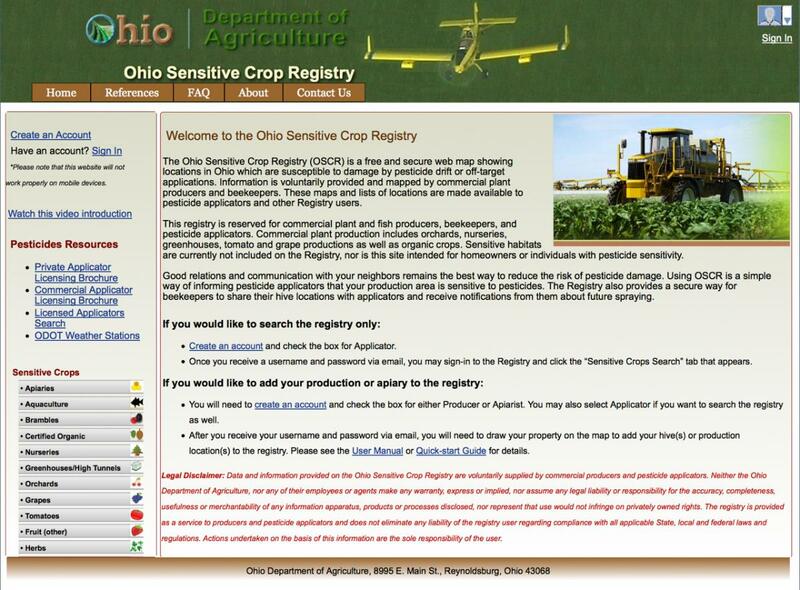 Screenshot of the home page of the Ohio Sensitive Crop Registry website. Step 3. Manage drift of the herbicides used on your own farm or vineyard. Set an example of pesticide stewardship. Fruits and vegetables include the most intensively sprayed crops grown in the United States. Consider the unspoken message you send to the community every time you apply pesticides, especially when using high pressure/high volume equipment. While many herbicides are registered for fruits and vegetables, most have severe restrictions due to the inherent high sensitivity of most crops. In some cases the herbicide injury problem is caused by an application made by the owner, rather than by a neighbor. The likelihood of drift is a multiple of many factors, but some important ones are wind speed, droplet size (determined primarily by nozzle type), the height of the nozzle above the ground or canopy, and the operating pressure. Drift can be minimized by spraying on a morning or evening with low but not zero wind conditions (3–10 mph), keeping the spray boom and nozzles close to the ground, reducing pressure (less than 30 psi), and using low drift nozzles that generate large droplets. What if drift damage occurs or is suspected? Know the symptoms of 2,4-D and dicamba injury on your crops and plan on scouting regularly during the time when grain growers are spraying (Figures 1 and 2). Early symptom detection (within a few days of drift) is important if you hope to detect residues of the causal agent—a data point that may be of great value in obtaining compensation. Prevention is better than cure. We encourage open and frank communication between all parties. Spell out the risk. Inform your neighbors about the high dollar value per acre of the crops you grow. Many specialty crops, and especially grapes, are relatively small in acreage but high in value, and are highly sensitive to trace amounts of 2,4-D and dicamba. Many are perennials and the consequences of drift damage can be dire and long-lasting. Even with the best of intentions drift incidents can happen. Before filing a drift complaint, talk to other people such as an Extension Educator to gather additional information. It is also a good idea to inform the suspected pesticide applicator about your concerns and try to work out a satisfactory solution. Being proactive when problems are first observed is critical. Document when symptoms were first noted and any knowledge you may have of pesticide spraying on adjacent properties. Take lots of pictures of damaged and injury-free plants, including close-ups. While laboratory analysis is not always called for, taking samples of damaged tissues is a good idea. Take samples from several plants, seal them in a zip-close plastic bag, and place them immediately in a freezer. 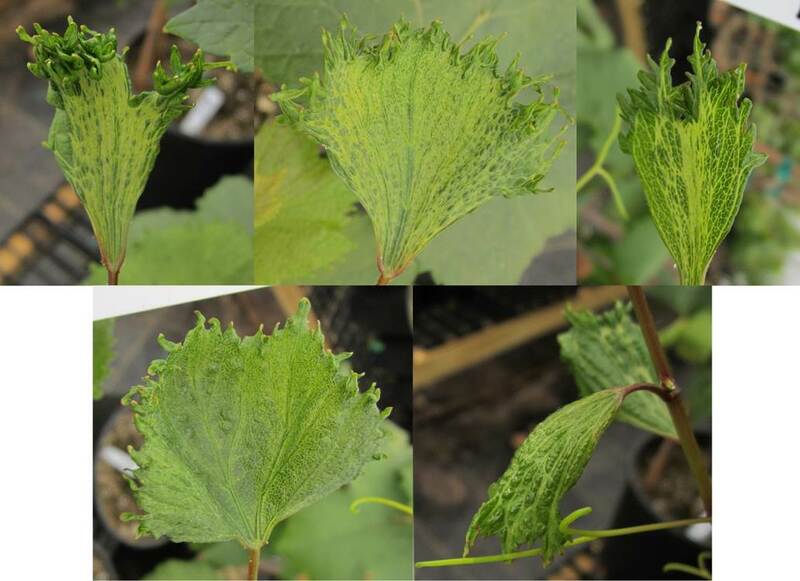 It is also a good idea to take a second sample of tissues from plants of the same cultivar that are not showing injury symptoms. If you are convinced that your crops or landscape plants were damaged by herbicide drift, you can file a complaint with the office of Pesticide and Fertilizer Regulation at the Ohio Department of Agriculture. Call 1-800-282-1955, then select option 31 and tell the operator that you want to file a pesticide use complaint. It is also very helpful if you can provide the name and address of the pesticide applicator. This could initiate an investigation.